Valerie asked what I was going to do with all the nekkid lemons . . . and here’s the answer. 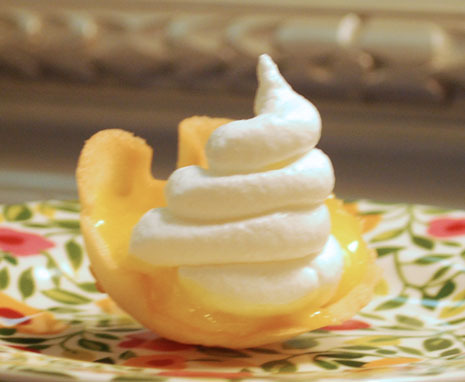 Little lemon meringue tarts. Here are all the little meringues, baking in the oven . . .
. . . here are the little shells, cooling in tiny champagne flutes to give them their shape. And I completely neglected to take a picture of the lemon curd, but you get the idea anyway. These are great, because you can store all the components separately for up to three days, and then assemble before serving. Preheat oven to 325 degrees. Make the shells: Put butter and sugar into the bowl of an electric mixer fitted with the paddle attachment; mix on medium-high speed until pale and fluffy. Mix in egg whites, one at a time. Mix in flour and vanilla. Spoon 1 scant teaspoon batter onto a rimmed baking sheet lined with a nonstick baking mat. Using the back of a teaspoon, spread into a 3-inch circle. Repeat 4 times. Bake until golden, 10 to 12 minutes. 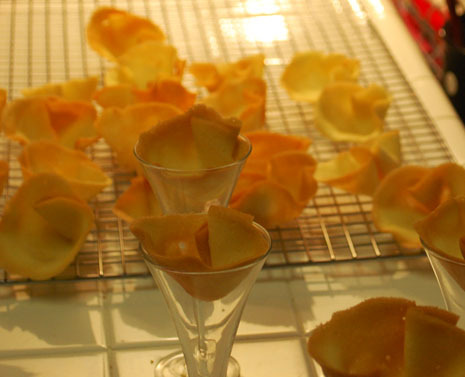 Immediately transfer cookies, one at a time, to inverted small tartlet shells or brioche molds; gently press to shape. Let set, about 30 seconds. Repeat with remaining batter. If cookies become too cool to shape, return them to oven for 20 seconds. Shells can be stored in an airtight container up to 3 days. Reduce oven temperature to 200 degrees. Make the meringue caps: Put egg whites and sugar into the bowl of an electric mixer set over a pan of simmering water; whisk until sugar has dissolved. Attach bowl to mixer fitted with the whisk attachment; beat on medium-high speed until stiff peaks form and meringue is cool, about 10 minutes. Transfer to a pastry bag fitted with a 7/16-inch star tip (such as Ateco No. 825). Pipe 20 spirals, 1 1/4 inches round and 2 inches high, onto baking sheets lined with parchment, spacing about 1 inch apart. Bake 20 minutes. Reduce oven temperature to 150 degrees. Bake until dry but not brown, about 2 hours more. Transfer meringues to a wire rack; let cool completely. 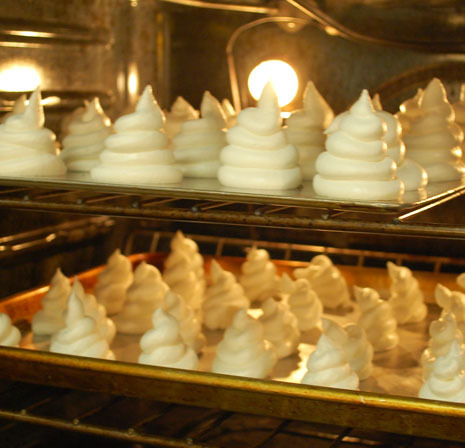 Meringues can be stored in an airtight container up to 3 days. Make the curd: Whisk egg yolks, lemon zest and juice, and sugar in a heavy, medium saucepan. Cook, stirring constantly, over medium-low heat until mixture registers 160 degrees on a candy thermometer, 8 to 10 minutes. Remove from heat. Stir in salt. Add butter, 1 piece at a time, stirring after each addition until smooth. Pour curd through a fine sieve into a medium bowl. Cover with plastic wrap, pressing it directly onto surface. Refrigerate until cold and set, at least 1 hour (up to 2 days). To serve, spoon 2 teaspoons curd into each shell. Top each with a meringue cap. This is absolutely beautiful and given that it can be done ahead of time, easy. Thank you for this great idea and the recipe to go for it. Okay, I still don’t understand what the lemons soaking in Vodka were for?? okay, so the lemons have been soaking in vodka for 4 days and I’ve been wondering what in the world I was going to do with my 10 skinned lemons (that did not involve lots of work) and what do you know, Femina has the answer for that too! These are so cute, I have to make them! I love doing baking like this late at night when everyone else is in bed and the house is quite. Those put the ZING in amaZING! I have a batch of the cups baking right now… they look so good! The first batch came out too dark (I found out 8 minutes is long enough) so my little sister are eating them and saying they taste like waffles. 🙂 thank you for providing an idea for our Easter Sunday dessert! Bekah gives the recipe for the Limoncello in her post called “As Promised.” Maybe you forgot to click the continue reading button? The recipe is there! I need to file that idea for later. We had a very lemon celebration ourselves for my husband’s birthday -lemon cake with lemon curd filling and lemon cream cheese icing. I made lemon curd for Easter, too… only for breakfast. I tried a recipe for a blueberry lemon curd pastry, and it was simply sublime! I love lemon curd! Blueberry lemon curd pastry sounds wonderful too!